The dressing can be made in advance and stored in the fridge for up to three days, making this salad even easier to put together. Heat the stock in a medium pan set over a medium to high heat. Add the chicken, bay leaf and coriander seeds. Bring to the boil, then reduce the heat and simmer for 20 minutes, until the chicken is cooked through. Use a slotted spoon to transfer the chicken onto a plate. Using two forks, pull the chicken fillets into shreds. Drizzle with the melted butter and season with salt and pepper. While the chicken is cooking, heat 1 tablespoon of the oil in a medium frying pan set over a high heat. Add the baby gems and fry for 4 to 5 minutes, until nicely browned, turning to ensure it colours evenly on all sides, then transfer to a platter. Add the remaining tablespoon of oil to the pan. Add the corn and fry for 5 to 6 minutes, until charred. Place the buttermilk, chives, garlic and lemon zest and juice in a jar. Screw on the lid and shake until all the ingredients are fully combined. To serve, arrange the baby gems on a platter. 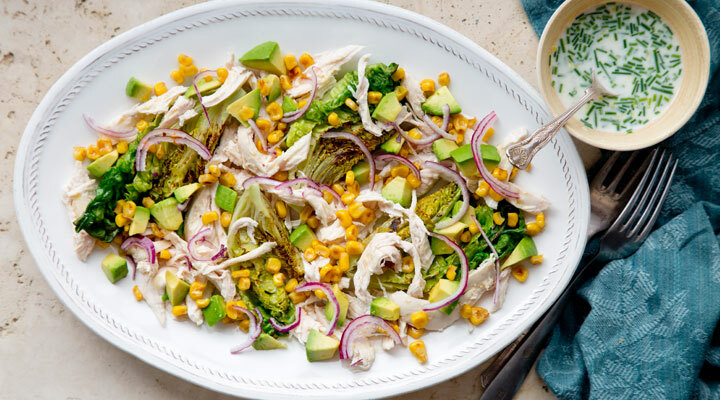 Scatter with the shredded chicken, charred corn, avocado and red onion. Drizzle with the buttermilk dressing and sprinkle over the coriander leaves.